Entering the performance area at the 64th annual Hero Thrill Show On September 22nd. James “Jimmy” Binns has had a successful career as an attorney, but the 75-year-old lawyer isn’t resting on his laurels. He is now part of the Darby Township Police force after graduating at the top of his class. 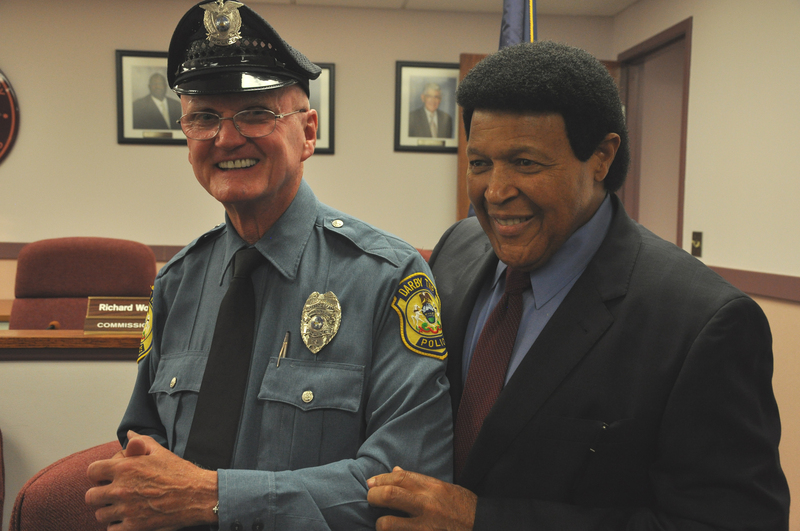 Photo 1: Attorney and community leader Jimmy Binns, 74, was sworn in as police officer in the Darby Township Police Department Thursday evening. Here he is seen with the Honorable Penna. 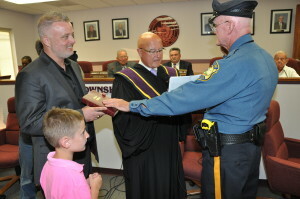 Supreme Court Justice Seamus P. McCaffrey and Binns’ son Jimmy and grandson Jimmy at the Darby Township Municipal Building in Glenolden, PA taking the official oath. Photo 2: Jimmy Binns, who graduated at the top of his class from the Municipal Police Academy in December, officially was sworn in as a police officer in the Darby Township Police Department on Thursday evening. 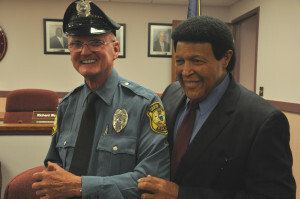 Binn’s friend Chubby Checker showed his support and attended the ceremony. Both are South Philly guys. Binns completed the mandatory nearly 800-hour, 11-month program covering physical, psychological, criminal law and firearms training and testing. He is an inspiring longtime community role model and champion in the law enforcement community in the Delaware. Binns was the Pennsylvania Boxing Commissioner and also has appeared in Rocky and Rocky V.
He has been honored for his exemplary leadership, commitment and contributions to the law enforcement community and as a role model for 30,000 youngsters in local Learning for Life & Exploring programs. 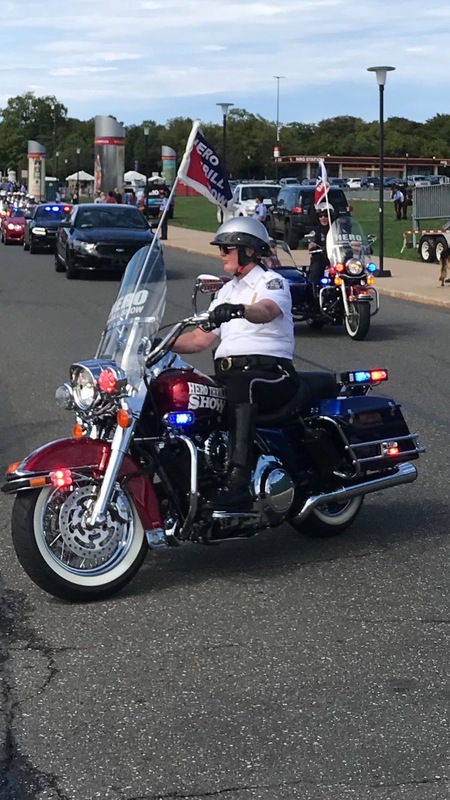 Binns is the Chairman of the annual successful Hero Thrill Show in Philadelphia designed to raise money for the education of survivors of deceased police and fire personnel killed in the line of duty in Philadelphia. Binns also is founder of the Hero Cop Plaque and Hero Firefighters’ Plague programs memorializing fallen police and fire heroes killed in the line of duty, and CopWheels, an initiative to raise money for critical police equipment and vehicles in the Delaware Valley. 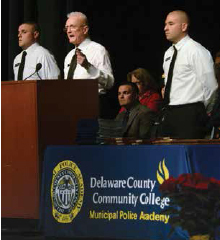 Attorney Jimmy Binns did what no other person in the history of the College has done—last year, he became the oldest graduate of the College’s Municipal Police Academy at the tender age of 74. To achieve this feat, Binns passed the Police Academy’s rigorous physical entry requirements with flying colors. He bench pressed 100 pounds and ran 1.5 miles in a little more than 15 minutes (3 minutes under what was required). Binns, who graduated on December 18, did so well that he was selected to be class lieutenant by his instructors, putting him in charge of his fellow cadets. At the graduation ceremony, which was held at Ridley High School in Folsom, Binns received an academic achievement award for having a 98.4 percent grade point average, the highest in his class, and an “overall achievement award” from the Delaware County Police Chiefs Association. When he walked off the stage for safekeeping, he handed the awards to his grandson Jimmy Ives, 7, his granddaughter Blair Ives, 5, and his daughter Amy Binns, who were seated in the front row. 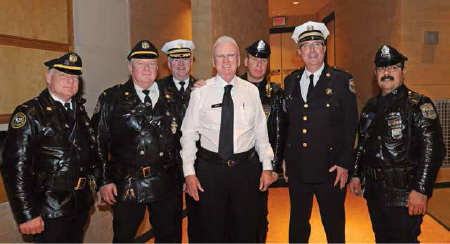 While taking his classes at night and on weekends, Binns worked full-time as an attorney in Philadelphia and continued his time-demanding schedule of heading his myriad of charitable causes, such as Holiday Meals for Heroes, the Hero Plaque Program, the Hero Thrill Show and Cops Wheels Inc., which provides equipment for police departments. Click here to download and read full article.